Social media use has skyrocketed in recent years, and it seems just about everyone takes to the internet to vent their frustrations, but is an employer permitted to forbid an employee’s mention of work, compensation or their employer on social media? Due to the relative newness of social media, laws regarding this are still in development, but the answer may surprise some employers. Obviously, an employer has a right to monitor an employee’s activities while on the clock. An employer can also forbid illegal activity, like harassment, threats, and corporate espionage. But can an employer prohibit their employees from disrespecting or criticizing their employer on social media on their own private time? Can an employer supervise an employee’s actions on the internet, or even require access to the social media pages of their employees? Sometimes. The NLRA (National Labor Relations Act) is a Federal Law established in 1935 that restricts employer reactions to labor unions, collective bargaining, strikes, or other forms of concerted activity to give the employees bargaining power. The NLRB (National Labor Relations Board) is a federal agency in charge of protecting the rights of the employees as dictated by the NLRA. This act guarantees rights to the employees even if the workplace doesn’t have a union or collective bargaining agreement in place. Section 8(a)(1) of the NLRA specifically forbids employers from the “unlawful surveillance” of an employee’s communication that could “interfere with, restrain, or coerce” an employee’s right to participate in a labor union. 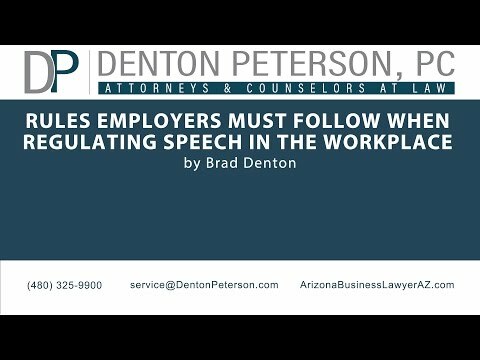 This law is meant to stop employers from intimidating their employees away from participating in labor unions, not to include all employee communications. The purpose of the NLRB is to preserve the rights of employees in the private sector to group together, with or without a union, to improve working conditions and wages. Obviously, the way we communicate has changed substantially since 1935, when the NLRA and NLRB were established. There are more than 1.3 billion social media users worldwide, giving employees a better ability to communicate and group together to effect change. Social media is the new gathering place for employees to organize unions, strikes, and other actions, while employers use it to network and advertise. As such, it is hard to tell the difference between intentional monitoring and inadvertent exposure. How can an employer know whether what they are doing goes against the NLRA? Lafe Solomon, the Board’s Acting General Counsel recently published a report stating that the protection of the NLRA extends to all communications judged to be “protected concerted activity,” which means communication which includes the discussion of wages, hours, terms and conditions of employment with other employees, and if such activity is the logical result of concerns employees have expressed as a group. However, an employee’s comments on social media are usually not protected if they are just complaints made without relation to a group activity including other employees. Solomon’s report used an example case to further demonstrate the point. The case included an employee who claims to have been constructively discharged for comments found on his Facebook page. The employee’s privacy settings were strict, but he had added his supervisor as a friend. The NLRB maintained that the employer did nothing illegal, since the employee intentionally and knowingly gave his supervisor access to his social media actions. The report shows that when an employee voluntarily grants access to their social media to their employer, anything the employer sees is not a “protected concerted activity,” and cannot be considered illegal monitoring. It is still unclear how the NLRB will deal with a situation where an employer is monitoring the Internet to access an unsecured union website that is publicly available, and the contains both information concerning an organized campaign that targets the employer, and links to social media forums where employees can discuss organized activity. If the link is only accessible to “friends” of the union, but the website contains information similar to that discussed on the forum, and a link to join, how far can an employer go without violating his employees’ rights? Some employers may argue rather convincingly that employees who join the website are just about as secretive as picketing outside business itself. When the court decides each case, all factors are taken into consideration, and an employer’s response can be just as complicated. Seek professional help from an experienced Arizona employment attorney. Many pending cases are still being considered that could alter the extent of NLRA protection. Developing law is tricky, and employers must seek professional assistance when constructing policies concerning social media use.